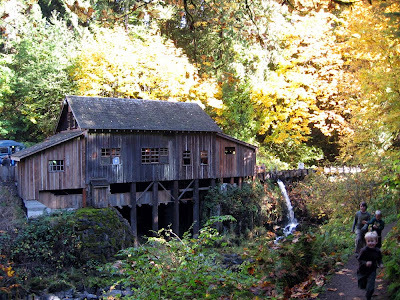 Yesterday Steve and I went out to the annual cider pressing that happens at the historical grist mill in Washington. We have gone a couple of times before, but have missed the last year, maybe two. 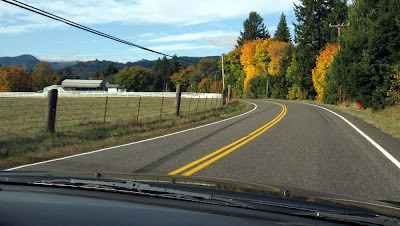 It is a lovely drive and the mill is beautiful. You have to wait in a very long line if you want to get some fresh pressed cider, but it is such a beautiful place to wait in line. 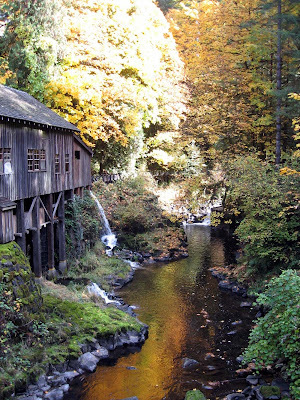 When we got there we started on the path, leading to the covered bridge. Once on the bridge you can lean out over the railing and look at all there is to see. Many leaves were falling during the bursts of breeze and enjoyed watching them fall in the creek and ride down out of sight. The day was sunny and the trees were so beautiful. 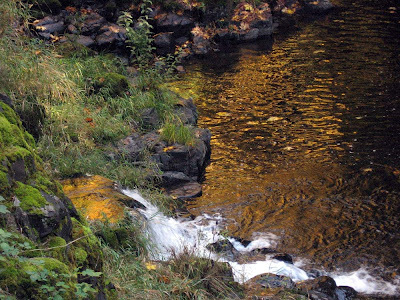 The water reflected the golden yellow of the trees and the creek looked like a pool of gold. It was so stunning. These pictures were not enhanced. The cider is really good. I am drinking some right now. 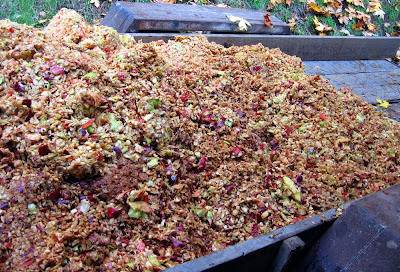 They press 8,000 pounds of apples this one day once a year. 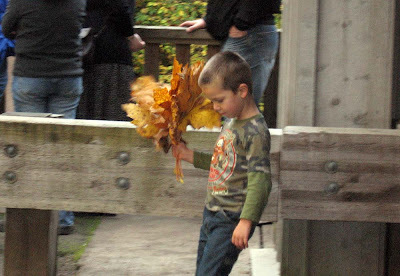 I loved seeing kids with handfuls of leaves. At one point when waiting in line a big breeze came through and a bunch of leaves fell, swaying and floating down on us. All the kids started laughing and whooping it up and even the adults were overwhelmed. It was neat. 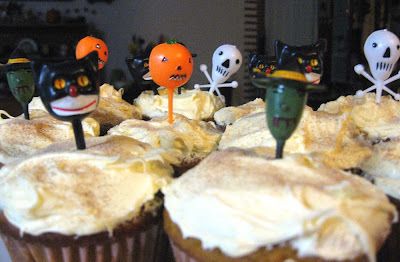 I had to make some cupcakes last night so I could use these cute Halloween cupcake toppers. Since I will be out of town for a few days this week, I wasn't sure I would be able to fit it in unless I did it soon. I got these toppers from abelemporium during the summer when she had a sale. They are really neat. The cupcakes I made are pumpkin with a butter cream frosting. I got the recipe from Martha. I sprinkled a little cinnamon sugar on the top, too. I recommend the recipe. It turned out pretty good and it was easy. They are almost muffins, but not quite. Today was a neat fall day and I had a neat fall outing. I will tell more tomorrow. What is your favorite fall event? I can never fit them all in. Baking is definately one of them. 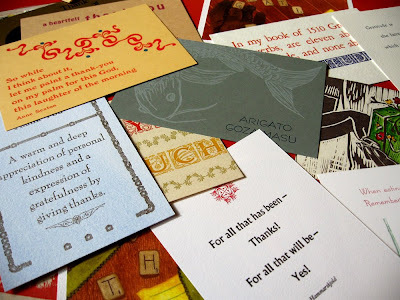 This summer I was invited by a co-worker who is a letterpress artist to take part in a postcard exchange. The Basement Printers have been creating and exchanging postcards for around 15 years, I think. It was mostly letterpress printers, but has evolved to include other artists. 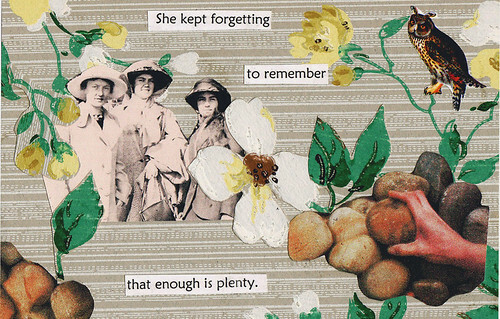 Since I have been wanting to do collage again I saw it as a good way to get back into it and created my postcard. 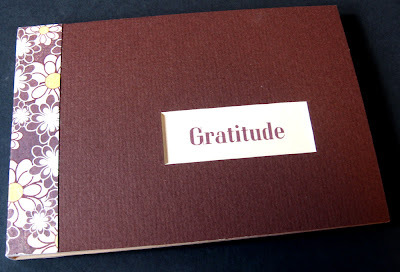 There is a theme each year and the theme for this time was gratitude. My co-worker, Judy, was the curator this year. 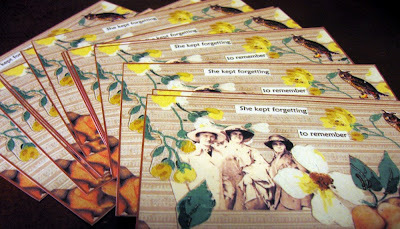 So, she collected the postcards and created the packaging for them. She did such a great job I can't imagine having to follow it. I am glad I do not have to. There were about 18 people who ended up taking part. Most of the people who are involved in this project don't seem to have websites. In fact, there is little correspondence between the members of the group. No yahoo group, no mass emails. Many of the particiapants are older and/or just are not interested in the internet. For someone like me, this was a little mind-boggling. 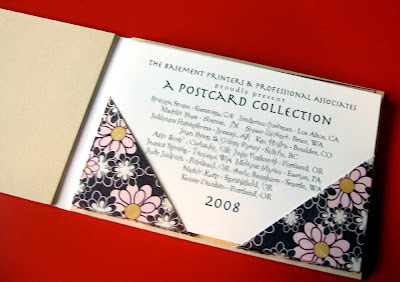 However, once I got the pack of postcards I was surprised by how I still felt a kinship, a kind of community with these women, even though I had never seen a profile, a flickr account or a blog. The postcard you see here below was done by Springtide Press. The only other postcard besides mine to have a website. If you are interested in taking part in this project let me know. It is once a year and they are looking for new participants. I love grey skies. 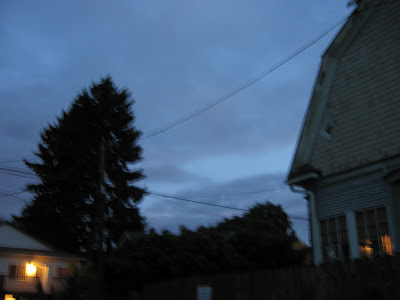 The layers of different greys in the clouds are so pretty and I love the way grey skies soften everything, making the twilight time so beautiful and cozy. 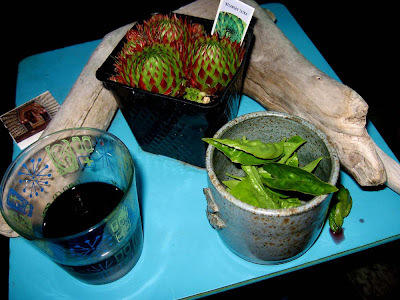 Tonight after I got home I went outside to have a glass of red wine and enjoy it. 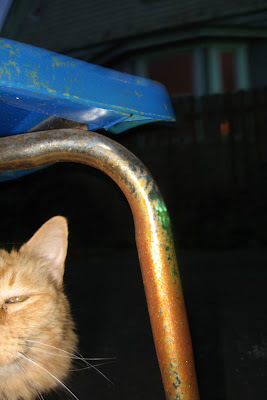 The cat came out to join me, but was very camera shy. I gathered some basil for my dinner and watched until it got dark. I made the pie from Alicia's blog this weekend. I got regular pie crusts and not deep dish, so I ended up with 2 pies! It turned out great as I could send one home with Steve. It was very good and easy. I think there will be more sour cream apple pies before the season is over. 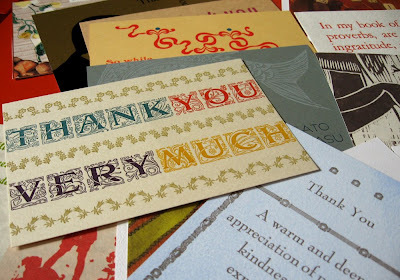 I have spent the last week sending out packages, working on a top secret anniversary project and copying yet more zines. If I ever think I am all stocked up - I am wrong. I have also sent out some emails and posts about a new project I hope to do. I am currently gathering materials for a possible fat zine anthology. It would be covering the last ten years of fat zines. If you know of any or do one yourself please get in touch with me (ponyboypress at yahoo). Anna Maria Horner's new sewing book, Seams to Me is almost out and her publisher is doing a sweepstakes for a new sewing machine and a copy of the book. You can sign up here and you can enter everyday if you want! There are some neat pumpkin ideas brought together for you at Poppytalk. 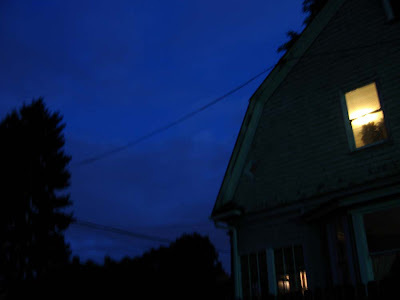 This is my favorite from Country Living (tips on how to do it on there, too). 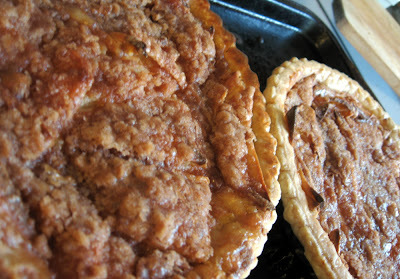 Posie Gets Cozy has a recipe for her favorite fall time treat - Sour Cream Apple Pie. I might have to make this this weekend. I am totally in the baking mood. 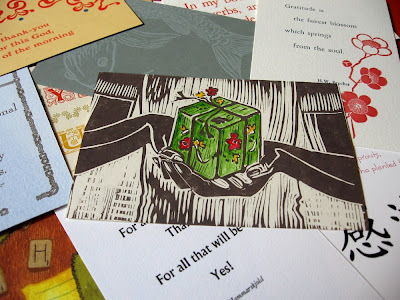 Sweet Tooth Crafts did a nice post about Letterboxing. I have heard about this activity for years but never quite understood it. Now, finally, thanks to her post, I do! Well, I think that is it for now. I hope you have an enjoyable weekend! I am looking forward to baking and exchange party and hopefully a lot of brussel sprouts! Yum!